As my PhD draws close to an end this summer, I’m in studio rehearsing a new performance that will be previewed at NIME, the international conference on New Interfaces for Musical Expression, at the end of the month. I’ve been working together with Baptiste Caramiaux to create Corpus Nil, a new body performance that wraps up the research I’ve done in the past three years combining physiological computing, performance art and cultural studies of the body to examine physical expression in sound performance. Here are some rehearsal pictures, visual sketches of the final performance. Corpus Nil is a performance for reorganised body, octophonic surround sound, interactive lights and biowearable musical instrument. Through a series of movements that explore the limits of muscular tension, limbs torsion, skin friction, and equilibrium the body is reorganised. 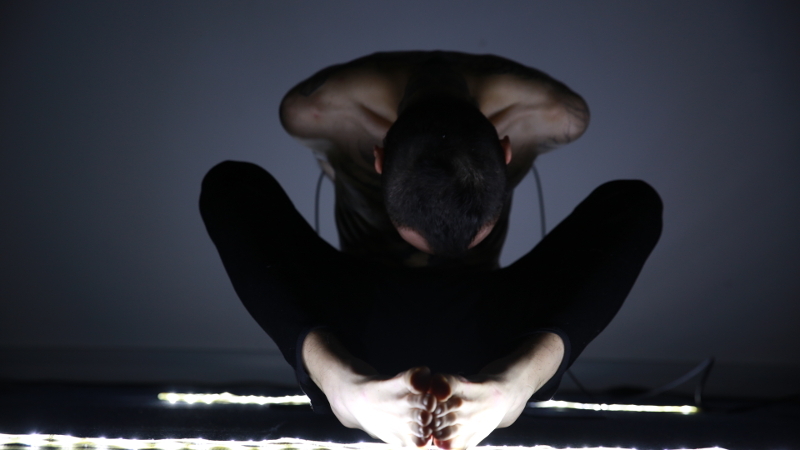 As the body morphs, its muscular force and brain activity are transformed into digital sounds and light patterns. The body and the machine are configured into one entity. Their relation is not one of control, but one of becoming. Together, the human body and the machine body become a new body. A body that is not necessarily human nor cyborg, it’s an expressive body of flesh, circuitry, transducers, sound and lights. Stay tuned for a video teaser to come out soon.